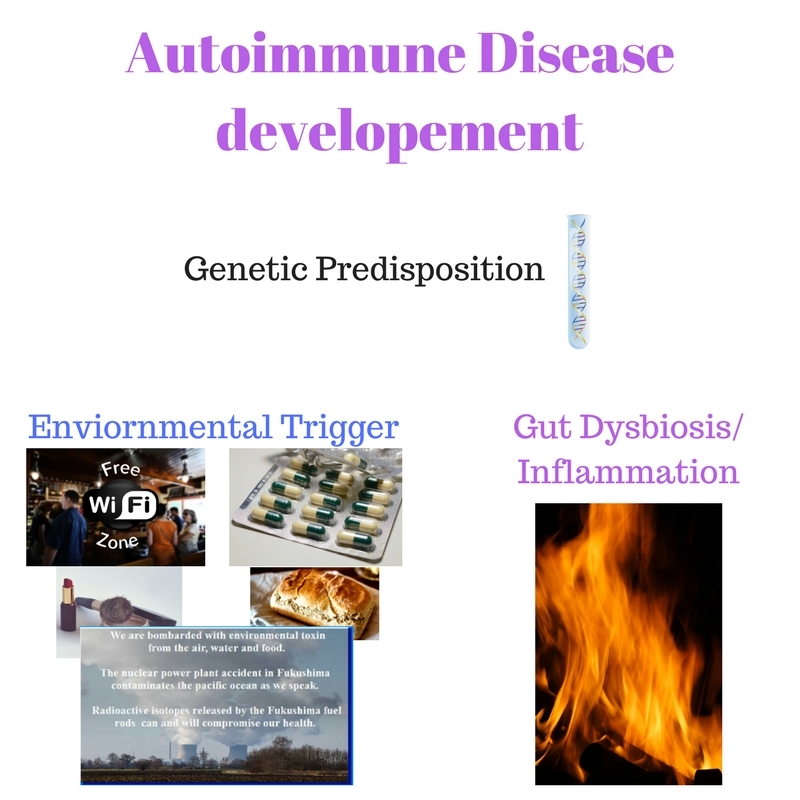 Autoimmune disease is on the rise. About 23.5 million Americans suffer from an autoimmune disease and the numbers are climbing. Do you suffer from those symptoms? Those symptoms could be signs of the development of an autoimmune disease. No matter if you are already diagnosed with an autoimmune disease or not, we need to know what the underlying causes for the immune system are that start the attack on the body’s own tissue. Genetics are usually blamed for all kind of dysfunction in the body. But, we know that the genes need a trigger or multiple trigger to act out. What are trigger for the immune system to start attacking the body? Environmental factors make up 70% of the risk to develop an autoimmune disease. Let’s face it, who can live a clean life nowadays? We can try our best to eat organic food that is not sprayed with chemicals and is not genetically modified. Still, we will be exposed to foods sprayed with glyphosate. When we talk about toxins we have to include those in the air and in our cosmetics. Although we can avoid toxins in our personal care products, in our drinking water and cleaning products, we cannot avoid those in the air. All of the above factors disrupt the immune system and it starts to have trouble recognizing self from non-self. Changes in the gut microbiome and increased gut permeability cause even more inflammation. When this condition becomes chronic, the immune system starts reacting to more and more proteins in the gut because it has trouble differentiating self from non-self. As you can see, when the immune system starts attacking “self”, the body’s own tissue, you end up with an autoimmune disease. Toxic chemicals can enter the tissue directly and induce antigen production. In fact, those chemicals can bind with the tissue and the immune system is now presented with a totally new protein which it doesn’t recognize and treats it as non-self. Antigens against this tissue are being formed which are called neoantigens. Pathogens can stimulate an autoimmune response through molecular mimicry, and disrupt the homeostasis of the immune system. In fact specific pathogens are associated with specific autoimmune diseases. For example, Epstein-Barr virus is associated with Hashimoto thyroiditis as well as Hepatitis C, Mumps, and Rubella. Akkermansia muciniphila helps to restore the mucus layer in the gut. What can be done to avoid an autoimmune disease and creation of new AI disease(s)? we can reduce sodium intake because sodium can increase IL-17, which is a cytokine that drives autoimmune diseases. I’m talking about table salt which is almost 100% sodium chloride. Potassium chloride is a better option. Having said this, you need to know if you can tolerate potassium. People with kidney diseases have trouble with potassium. Talk to your physician if you need any advice in this regard. Instead of using a lot of salt, you could try to add fresh herbs such as garlic or garlic powder, lemon juice, apple cider vinegar, or herb blends, turmeric, nutmeg, cinnamon, fresh ground pepper, or oregano. Reduce glyphosate intake. The way to control glyphosate on your food is by growing your own produce. Chemicals need to be reduced or eliminated. Check the labels on your personal care products and make sure they are free of any chemicals. You can go to the EWG.org and search for cosmetics that are natural. Check your cleaning products for chemicals. Windows can be cleaned with vinegar and water and dried with newspaper. You will be surprised how clean they will when you use this method. The bathroom and kitchen can be cleaned with baking soda. A mixture of water / vinegar/ essential oils (lemon) in a spray bottle can be used for kitchen counter and other surfaces. Avoiding gluten, grains and other produce sprayed with glyphosate to protect the gut lining. Oats are often time sprayed with glyphosate. Reduce the exposure of EMF (electromagnetic frequencies) by turning off wifi, set your cell phone to Airplane mode, ground your laptop. Bacteria live on fiber and by eating a variety of foods you ensure the intake of such. Leaky gut drives inflammation. The underlying causes of leaky gut need to be investigated and eliminated. Megaspore helps the body to heal itself from leaky gut. Of course the entire list I mentioned of environmental trigger need to be eliminated or at least drastically reduced. Reduce fat intake under 40% of the daily caloric intake, because it a high fat diet reduces Akkermansia muciniphila and Faecalibacterium prausnitzii. Omega 3 and 6 fatty acids help protect against inflammation. Increase plant based foods to increase Akkermansia muciniphila, Faecalibacterium prausnitzii production because they up-regulate T-reg cells. Fasting helps to increase the amount of Akkermansia muciniphila, Faecalibacterium. Be careful with fasting when you have adrenal issues and or blood sugar issues. Fasting in order to support gut health means not eating anything for 12 -16 hours, which can be done overnight. Resistance starches help increase those bacteria as well. Megaspore contains certain strains of bacteria which support other bacteria in the gut. Some bacteria produce metabolites which are beneficial to others such as increasing or suppressing the growth of other bacteria. The spores in Megaspore increase the diversity of the microbiota. The spores also produce short chain fatty acid which helps to seal tight junctions in the gut. Spores also reduce the inflammatory responds to foods.